by combining the afternoon programme. Dr Feinberg graduated from the University of Bristol gaining a BDS with honours. Upon graduation he worked in private practice near London. He then worked in two different London hospitals where he gained experience in Oral and Maxillofacial Surgery, Oral Medicine and Oral Pathology. He now works as a Clinical Lecturer and Honorary Speciality Registrar in Dental and Maxillofacial Radiology at the University of Liverpool. An introduction to 3D imaging and comparison of the modalities available. 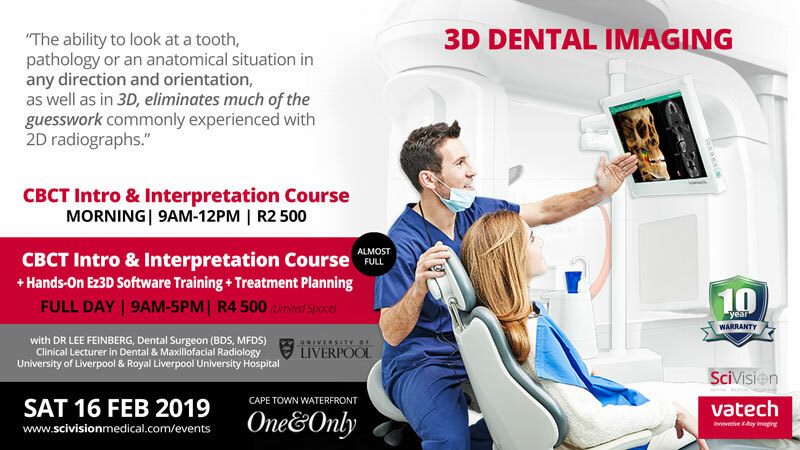 Learn about superior surgical planning, optimal risk assessment for your dental practice, including hands-on training on the Vatech Pax-i3D range of CBCT X-Ray images and software. This CBCT X-Ray training course is complimentary for new Vatech/SciVision CBCT buyers, including additional in-practice advanced training if purchased in the next 4 months. Apply to attend this informative course before investing in a Vatech CBCT, and if purchased, course fee will be re-imbursed. Vatech CBCT's include 10 year warranties.